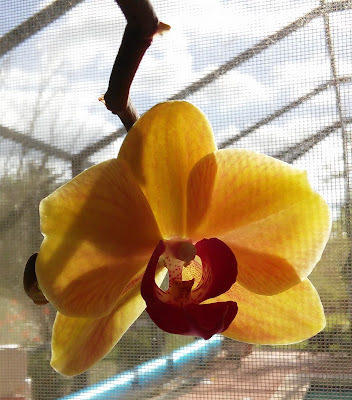 This is Cindy's daughter posting...Cindy wants you all to know that she is doing fine but her Internet is not! They are having technical difficulties and will not have Internet access until July 9th or so. Tropical Storm Debby is bringing tons of rain-the pool is way too full and the cats are disgusted with all the wet! We are very happy with our +6" so far and more due today. I received this angora fiber for my FiberBinderClub this month. I hand carded it then spun it on my little takli spindle. The cats went crazy over the smell and I had some tricky maneuvers a few times to get away from them but over all it spun similar to cotton but not quite! I plied it on the takli, too, and it plied very easily. What an amazing little skein of angora yarn! I knit it up into a swatch for my reference binder-I wish I could share with you how soft it is-and light as a feather! Marsel and the kids came for a week's visit! I have been pampered and loved all week-it has been wonderful to have their help and company! The kids enjoyed the pool time while we spent a lot of time in the sewing room. Marsel set up a rest area for me in the corner so I could knit and read and keep her company! Marsel brought the quilt she has been working on for Abigail's room and worked on getting it quilted . I am making progress on my knitted lace scarf. Later in the week, Marsel and I worked through the pile of fabric for Krystle's nursery-the crib sheets , valances and crib skirt are finished and mailed and now I will be doing the appliques for the comforter! Marsel brought this quilt for me to work on-her friend made it for her grandmother-isn't it beautiful!?! We got it loaded on the frame so I can begin work on the quilting on Monday. Yesterday was Bill's birthday-nice to get to share it with the kids! Here is a glimpse of the quilt Marsel quilted. The edge will be scalloped so she has some binding work when she gets home but the quilt is well on its way to done. And I am well on my way to walking normal-the foot is finally getting back to normal proportions! Thank you to Nurse Jane Fuzzy Wuzzy and her assistants! .... Just a lot slower and taking a lot of pit stops for knitting. I still can't stand for long. I started a KAL with my fiber group on Yahoo and this is the pattern for a scarf! Lace weight yarn on #6 needles. I finished the face cloth and am casting on the second one on smaller needles for a tighter knit. This blocked out at 12" square-very soft. I have been plugging away on the quilt on the frame ( so that it is empty for Marsel to use when she gets here tomorrow)! I could only do one row before I had to sit down-10-15 mins is tops for standing up! But as with many of my projects, just keep plugging away and it finally gets the job done! So much texture-I do like to use a very curvy quilting pattern when the piecing is very geometric. The 'hug' yarn is blocking so it will be ready to give to Marsel tomorrow! I even have the buttons to sew on in the morning . This yarn just keeps giving out hugs! I finally started a bit of sewing on the nursery pile-this is the beginning of the crib skirt. And the variegated yarn is turning out nicely-I have plenty of knits on the needles so I do not get bored! This afternoon Bill drove me to St Augustine for an appointment with the orthopedic specialist. After the doctor's appointment, Bill rewarded me with a dinner at one of our favorite restaurants. It was just perfect to eat overlooking the ocean. On the way home, the the clouds were rolling in. The palm trees never cease to thrill us; they make the scenery to tropical and remind us of where we are every time! I can walk again! The first few hours were pretty painful but being upright cancelled out the pain! No more crutches! The doctor expects great improvement in two weeks......the nerve damage might take longer but as long as I can walk, I will be overjoyed! Here's to being upright. We made it home just ahead of the rain-we have been blessed with 10" this last month which is more than we had all of last year! Knitting.........doesn't care how many feet you have or not. Hmm, baby items for some reason. I have started a shawl with the yarn spun and dyed.........Slice of Spring pattern. And I received this wonderful book by Kay Meadors........filled with quick and easy patterns and beautiful gift items. It is a great addition for your own knitting library, charity knitting or for your guild library. I am starting with the dishcloth with some KnitPicks yarn from my stash. JD has found a new hiding spot when the rain drives her inside......isn't she cute?! 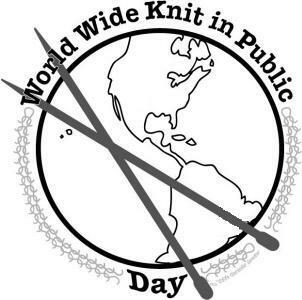 Invite some friends and have a good day celebrating the art of knitting! Bill is driving me to our public library where I will be meeting friends to knit today! It took me several days to cut out all this fabric for my grand daughter-to-be's nursery. I utilized muscles that have been dormant to save my foot from doing its job! I did most of this while sitting flat on the floor, measuring and cutting and bending........uff da! But the good news is that everything is cut out and there was enough fabric for all the desired components! I tried to do some spinning but it is just too painful for my foot still. So, some more one footed spinning which is awkward but it produces yarn! This is 45 yards of polypay yarn-a first for me but a delightful spin! she has even participated in the role of inspector; knitting still fills most of my sitting hours! My sister in law, Shelly, had given me some of her golden labs pretty fiber to spin. I spun it up and then knit her this little coin purse for a Darby memoir. It is nice to have something to remind you of one of those special pets. as big guy , Bubba, has moved on. We have searched for weeks and no sign of him. We always have room for another little affectionate waif. I have to come up with a good name for her now. A Hug in a Box! See what came in the mail today! Happiness in a box-the McKees sent me some yarn to encourage me to stay off my foot! It is a bribe and it works. I immediately set it to the needles and savored the feel of good yarn in my hands! I am using the Philomena cardigan pattern again.